This tour was truly a ride of a lifetime!!! Kevin was informative, kind and safe. It really did give us memories that will last a lifetime. HIGHLY recommend. The vintage Biplane was such a unique experience and is worth EVERY cent. Kevin and the girls in the office are the best! Had a great time and we are planning on doing it again next year!!! Loved it!!! Harry, our pilot, was awesome and the views were spectacular!! We would do it again and again. Scheduled for this tour but Biplane out of commission and waiting on parts. So I gave it 3 stars for allowing me to schedule when it was not even available. Took another small plane tour with same company but was delayed TWICE. They did give each of us a free T-Shirt, but I would have rather been on time. Pilot was good in assisting passenger with motion sickness. Very good tour, pilot was well informed about the island. Staff were helpfull and very friendly. Much better than any helicopter tours. 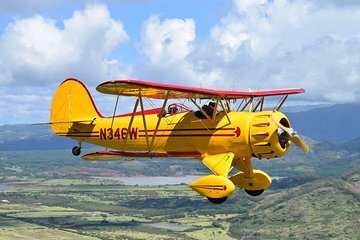 What a great way to see Kauai! Had a great time, saw everything we wanted to see in the convertible of the skies : Would definitely reccommend this tour to those visiting Kauai.. Our pilot Harry was very knowledgeable and even threw in a few trick moves at the end! What a fantastic way to view the island and all of her beauty! A complete tour of the island after my wife and I drove the day before! A definite inclusion to an agenda if you wish to see the island with the wind in your hair! Fantastic experience! We took the 10 flight and it could not have been better. Harry, the pilot, provided a great experience from the pre-flight history lesson, to understanding the plane, to preparing to fly to landing. We saw whales, mountains,valleys, the NaPali coast,beaches and golf courses. We recommend doing this flight early in your trip and to wear a jacket. Bring your camera!